WASHINGTON (Reuters) - Brazilian President Jair Bolsonaro endorsed U.S. President Donald Trump's immigration agenda on the eve of their first meeting at the White House, saying he supports a wall on the U.S.-Mexico border and that most immigrants to the United States wish to do harm. Ahead of Tuesday's Oval Office meeting, Bolsonaro waived a visa requirement for U.S. visitors to Brazil and later in a Fox News interview on Monday night threw his weight behind Trump's immigration agenda, which includes a wall on the Mexican border. "We do agree with President Trump's decision or proposal on the wall," Bolsonaro said, in remarks translated to English by the broadcaster. "The vast majority of potential immigrants do not have good intentions. They do not intend to do the best or do good to the U.S. people. "I would very much like the U.S. to uphold the current immigration policy, because to a large extent we owe our democracy in the Southern Hemisphere to the United States," he said. 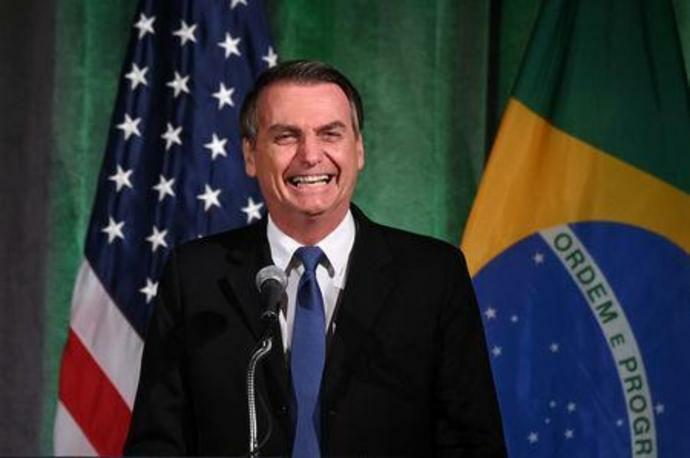 Bolsonaro, a former army captain, rose to power praising the U.S.-backed military government that ran Brazil for two decades before a return to democracy in 1985, echoing Cold War rhetoric in his presidential campaign about the need to fight a continued communist threat.